The first half of 2018 saw AccorHotels continue the deep-seated transformation of its business model, with the sale of a majority stake in the capital of AccorInvest, the integration of Mantra in Australia and Mantis in South Africa, and the acquisition of Gekko in France. The second half of the year will see Mövenpick in Middle East, Atton in South America and sbe in the US join our network, enabling us to consolidate our market shares and the vast array of choices we offer our customers. The Group’s strong operating performance delivered solid results in first-half 2018 and record organic growth with the opening of 20,000 rooms over the period. Today, AccorHotels operates more than 4,500 hotels and 650,000 rooms around the world, the majority of which are located outside Europe. Underpinned by a reinforced pipeline, the Group’s strong prospects mean it is firmly on track to achieving its medium-term targets. AccorHotels benefited from solid business levels in most of its key markets in the first half of 2018. With the opening of 45,150 rooms (301 hotels) during the period, of which 19,757 through organic growth and 25,393 via the acquisitions of Mantra and Mantis, at June 30, 2018 the Group had a portfolio of 652,939 rooms (4,530 hotels) and a pipeline of 167,000 rooms (959 hotels), of which 79% in emerging markets. Consolidated revenue for the first half amounted to €1,459 million, up 8.0% like-for-like and 3.0% as reported compared with first-half 2017. Like-for-like: at constant scope of consolidation and exchange rates. Changes in the scope of consolidation (acquisitions and disposals) and the positive contribution of €42 million (+3.0%) linked to the acquisitions of VeryChic, Availpro, Mantra, Mantis, Gekko, ResDiary and Adoria. HotelServices reported business volumes of €8.9 billion, up 10.3% at constant exchange rates, and revenue of €1,205 million, up 6.8% like-for-like thanks to healthy growth and the fast pace of development. HotelServices Management & Franchise (M&F) revenue amounted to €433 million, a like-for-like increase of 6.8% that reflects the solid growth seen in most of the Group’s key markets. Robust business levels drove revenue growth in Asia-Pacific (+10.0%), North America, Central America & the Caribbean (+15.9%), South America (+9.0%) and Europe (+4.2%), while the Middle East & Africa region recorded a slight decline (-0.2%), primarily attributable to the Gulf region. 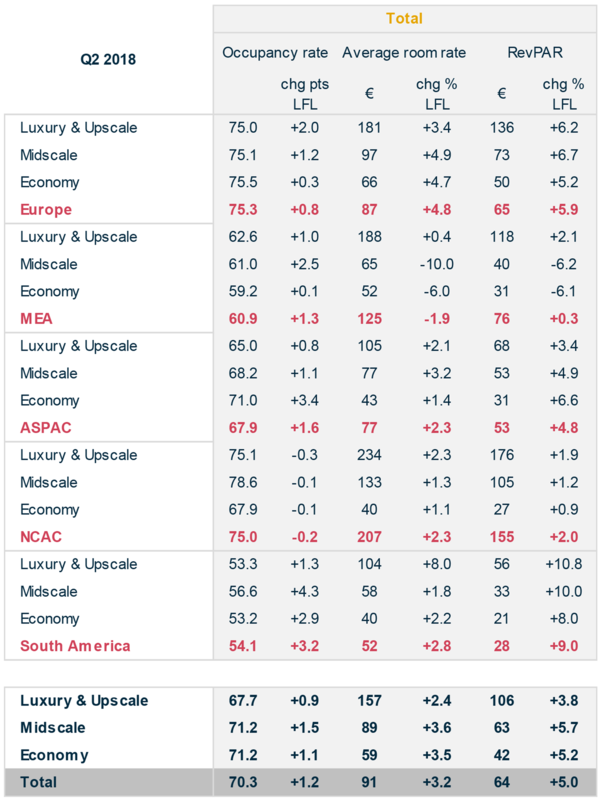 HotelServices RevPAR rose by 5.1% overall, reflecting gains in all segments: Midscale (+5.4%), Economy (+5.2%) and Luxury/Upscale (+4.6%). In Europe, M&F revenue was up 4.2% on a like-for-like basis, underpinned by a 5.4% increase in RevPAR thanks to higher average room rates. RevPAR in France rose by 5.6% on the back of strong growth in Paris (+9.5%). The capital benefited from the best occupancy rates (+3.3 points) and much higher room rates (+4.6%) as a result of an influx of foreign tourists. RevPAR in the United Kingdom climbed by a moderate 1.3%, with the provinces driving growth (+2.1%). These results reflect an improvement in the second quarter, following a slight decline in RevPAR in the first three months of the year. Germany recorded a 1.5% increase in RevPAR for the first half, thanks primarily to a favorable trade fair calendar in June, including in particular the International Metallurgical Trade Fair (METEC) and the World Exhibition Congress on Chemical Engineering (ACHEMA). The very favorable RevPAR trends seen in Eastern Europe continued during first-half 2018, with a 6.2% gain overall. The Asia-Pacific region performed very well, turning in growth of 5.0% in RevPAR and 10.0% in M&F revenue. 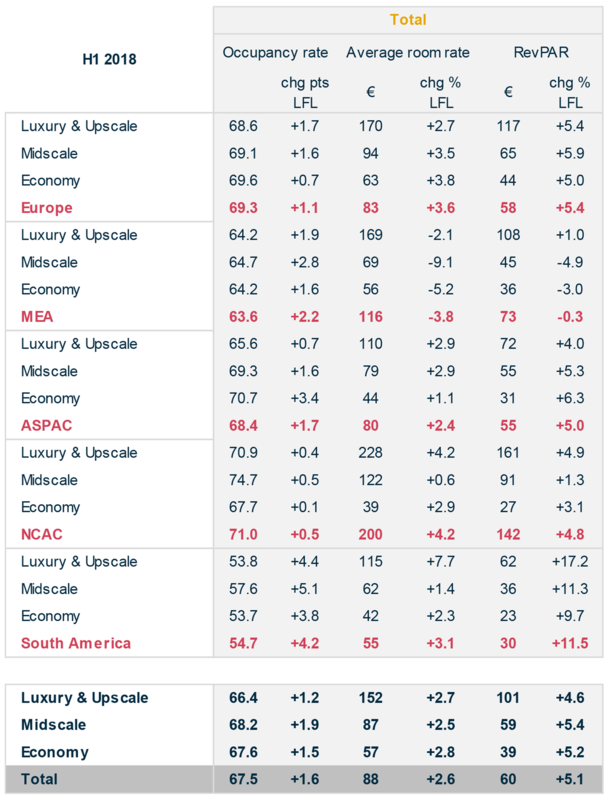 With RevPAR down a slight 0.3%, the Middle East & Africa region posted stable M&F revenue (-0.2%). North America, Central America & the Caribbean recorded a sharp increase of 15.9% in M&F revenue. The region’s RevPAR (+4.8%) reflected very robust activity in Canada (+7.5%), with strong growth in both the Leisure and Business segments. Lastly, the situation continued to improve in South America, with RevPAR up 11.5% for the region. The increase was driven by business growth in Brazil, despite the strikes that paralyzed the country in May and the situation in Rio, which continued to be affected by a depressed socioeconomic environment and the overcapacity generated by the Olympic Games. Organic development reached new record levels in the first half of 2018. Excluding acquisitions, AccorHotels opened 135 new hotels during the period, representing a total of 19,757 rooms. The future also looks very promising, thanks to a pipeline of 959 hotels and 167,000 rooms at June 30, which is a sharp increase on the end of the first quarter (157,000 rooms). Services to Owners revenue, which includes the sales, marketing, distribution and loyalty division, as well as shared services and the repayment of hotel personnel costs, came to €773 million, versus €788 million at end-June 2017. New Businesses now also includes Gekko’s hotel reservation solutions for business travelers, ResDiary’s restaurant reservation and table management services and Adoria’s management solutions for corporate and contract catering. For first-half 2018, New Businesses recorded revenue growth of 7.1% like for like and 61.5% as reported, with revenue amounting to €70 million for the period, versus €43 million in first-half 2017. Hotel Assets revenue increased by 8.6% like-for-like to €389 million. Europe accounted for 54% of the division’s revenue, Asia-Pacific (Timeshare, Strata and Accor+) for 25% and South America for 16%, and its RevPAR rose by 10.6% like-for-like. At June 30, 2018, the division’s hotel base included 229 hotels and 41,890 rooms. Consolidated EBITDA amounted to €291 million in the first half of 2018, up 4.2% like-for-like and down 3.2% as reported, compared with first-half 2017. The currency effect had a negative impact of €19 million. The EBITDA margin dropped by a slight 1.3 points to 20.0%. Up 6.7% like-for-like, HotelServices EBITDA amounted to €312 million for first-half 2018, versus €311 million for the prior-year period. Gaining 0.4 points, HotelServices' EBITDA margin firmed to 25.9%, compared with 25.5% in the first half of 2017. HotelServices M&F reported EBITDA of €307 million for the first half of 2018, an increase of 7.4% like for like on the €303 million recorded in the prior-year period. Up 0.8 points, the EBITDA margin for HotelServices M&F also increased to 70.9% from 70.1% in first-half 2017. In line with the healthy levels of business observed in the regions, the HotelServices M&F division recorded strong EBITDA gains in all of its markets. Europe (+5.5%) profited from positive revenue trends. The Asia-Pacific region (+6.4%) held up well despite a high basis for comparison and including non-recurring costs in China. The Middle East & Africa region (+12.7%) benefited from the reversal of a doubtful debt provision. In the North America, Central America & the Caribbean region (+12.6%), robust business levels drove an increase in incentive fees. South America (+9.9%) benefited from the strong recovery in Brazil excluding Rio. At a negative €15 million, EBITDA for New Businesses was stable as reported and down 53.7% like-for-like. This decrease is mostly attributable to onefinestay and John Paul, where topline growth notably relies on synergies and scaling plans with AccorHotels, which have not been delivered as planned. This, with incremental development costs, led to a negative scissor effect weighing on current performance. In light of these factors, the Group recorded a provision for impairment at June 30, 2018, for an aggregate amount of €246 million. Nevertheless, the Group firmly believes that both serviced private homes and concierge services offer strong potential in the Group’s ecosystem. EBITDA for Hotel Assets increased slightly in first-half 2018 to stand at €54 million, versus €53 million in first-half 2017. EBITDA margin came to 13.9%. In the six months to June 30, 2018, funds from operations dropped to €235 million, versus €252 million in the same prior-year period. Recurring investments, which include HotelServices’ digital and IT investments, as well as Hotel Assets’ maintenance and development investments, mainly related to the Orbis scope, amounted to €60 million compared with €66 million in first-half 2017. The change in working capital requirement (including the change in assets and liabilities on contracts) is positive at €22 million. As a result, recurring cash flow rose to €196 million, compared with €122 million in first-half 2017. The improvement in net debt during the first half resulted in a positive net cash position of €985 million at June 30, 2018. The change notably reflects net acquisitions for €949 million and €317 million for shareholder dividends, which were amply offset by the €4.6 billion cash injection from the sale of 57.8% of AccorInvest. At June 30, 2018, the average cost of debt was around 2%. On July 2, 2018, AccorHotels signed a new €1.2 billion revolving credit facility, whose margin is linked to the Group’s environmental, social and governance (ESG) performance. Besides, as announced on February 27th following the signing of the agreements for the sale of a majority of the capital of AccorInvest, the Group confirms its intention to implement quickly a sharebuyback program of up to €1.350bn euros. The Group is forecasting full-year 2018 EBITDA of between €690 million and €720 million. On June 3, 2018, as part of its strategy to enrich its range of services in the travel space, AccorHotels stated that it was considering the establishment of a strategic alliance with Air France-KLM. Reflections included a potential acquisition of a minority stake in the capital of Air France-KLM, jointly with French and European investors. The Group remains convinced that a strengthened partnership between hotel companies and airlines offers significant value creation potential. However, given that required conditions for the acquisition of a minority stake in Air France-KLM have not been met at this stage, AccorHotels has decided not to further pursue this opportunity. Sale of 57.8% of the capital of AccorInvest to sovereign wealth funds Public Investment Fund (PIF) and GIC, institutional investors Colony NorthStar, Crédit Agricole Assurances and Amundi, and other private investors. Signature of a strategic agreement to acquire a 50% stake in Mantis Group, a South African hospitality and travel conglomerate. Signature of a memorandum of understanding with Ctrip to offer the best possible experience to Chinese travelers. Signature of an agreement with Mövenpick Holding and Kingdom Holding to acquire Mövenpick Hotels & Resorts, for €482 million. Signature of an agreement between AccorHotels, Algeciras and the shareholders of Atton Hoteles for the acquisition of Atton Hoteles. Acquisition of the Mantra Group for €830 million. Creation of a strategic partnership with Dalmata Hospitality, France’s leading independent hotel management company in the Economy segment. Signature of a letter of intent with sbe Entertainment and entry into exclusive negotiations to acquire a 50% stake in the company. Acquisition of ResDiary, a leading platform for restaurant reservation and table management. Acquisition of Adoria, a SaaS platform that enables the catering industry to optimize supply management. Signature of an agreement with a consortium of 15 banks establishing a new €1.2 billion revolving credit facility for which the Group’s environmental, social and governance (ESG) performance will be taken into account in calculating the margin. Creation by AccorHotels and Katara Hospitality of a fund with an investment capacity of over USD 1 billion targeting the hotel sector in various Sub-Saharan African countries. On July 25, 2018, AccorHotels received a binding offer from Colony NorthStar to acquire an additional tranche of 7% of AccorInvest’s share capital, for €250m. After completion of this transaction which is subject to AccorInvest Board of Directors’ approval, AccorHotels will retain a 35.2% stake in AccorInvest’s share capital. The Board of Directors met on July 25, 2018 and approved the financial statements for the six months ended June 30, 2018. The consolidated financial statements have been audited and the Auditors' report is being issued. The consolidated financial statements and notes related to this press release are available from the www.accorhotels.group website.